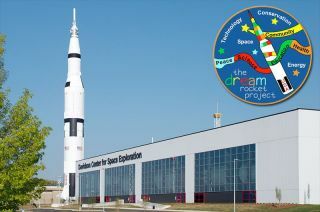 The Dream Rocket, an art project, has proposed wrapping in a student-created quilt the real Saturn V rocket inside the Davidson Center for Space Exploration at the U.S. Space & Rocket Center in Huntsville, Alabama, rather than the replica standing outside. An ambitious art project to wrap one of NASA's remaining moon rockets in a student-created quilt has traded height for history by proposing to swap Saturn Vs. The Dream Rocket, a four-year-old educational effort run by the not-for-profit International Fiber Collaborative (IFC), initially aimed to completely cover the 363-foot-tall (110.6 meter) rocket — a replica of the booster that launched the Apollo crews to the moonin the 1960s and '70s — at the U.S. Space & Rocket Center in Huntsville, Ala. Now, they've changed their focus, sideways, looking to wrap the real rocket that is displayed on its side nearby. "Wrapping the indoor real Saturn V moon rocket would have profound impact beyond our original intent to wrap the vertical Saturn V replica, [so] we would like to pursue this option," March wrote on Kickstarter.com. "It would be awesome to walk under the entire length of the indoor rocket and look up to see all the art." "We would have a hard time seeing all of the art on the outdoor vertical rocket," she added, citing its sky-scraping height. The project, which hopes to have the iconic black-and-white rocket wrapped in 8,000 colorful artwork squares by May 1, 2014 for a 60-day exhibition, is now attempting to raise $24,150 from the public to begin its design phase this summer. The team needs to complete its engineering drawings, create color renderings of the display and build a three-dimensional model of the wrapped Saturn V. As of Tuesday (June 4), they were about 15 percent of the way to their funding goal. "Bound for the Moon, July 16, 1969," one of the 8,000 art squares created for The Dream Rocket’s quilt that will cover a Saturn V moon rocket. To date, the Dream Rocket has collected art submissions from children in 17 countries, 46 of the 50 states and 365 communities. The students' designs focus on the subjects of health, science, technology, community and peace, all falling under the theme "Dare to Dream." "[NASA's Saturn V] is an example of the power of people working together to achieve great things and to move our communities forward," March said. "In doing so, it has connected subjects like freedom, equality and community, all types of subjects — space, of course — to give students an access [point] into these subjects." "For some students this is their first introduction to space, science and art," March states on the project's Kickstarter page. The design phase, which the project wants to complete by Nov. 1, also brings together art, space and science. According to the project's consultants, wrapping the rocket will require a framework to support the completed quilt. The fabric panels will not be permitted to rest on or touch the 40-year-old booster in any way, requiring that the quilt be independently supported from the roof or the floor. The Dream Rocket project has recruited a senior engineer from the Topeka, Kan.-based engineering firm of Bartlett & West to mentor students at nearby Washburn University while designing the exhibit's support structure. Once a chosen design is developed, the exhibit will need to be approved by the U.S. Space & Rocket Center and by the Smithsonian's National Air and Space Museum in Washington, D.C., which has responsibility for the Saturn V rocket. Omitting the one-of-a-kind vertical replica that was erected in Huntsville in 1999, there are only three complete Saturn V rockets still in existence. NASA's Kennedy Space Center in Florida exhibits one of the three, comprised of real and mockup hardware. The agency's Johnson Space Center in Houston has another, the only booster made up completely of once-flight-worthy components. The third Saturn V, housed since 2008 in the Davidson Center for Space Exploration at the U.S. Space & Rocket Center, was a full-size prototype used for ground tests and fit checks prior to the first Saturn V launch. In 1987, it was declared a National Historic Landmark. In addition to serving as the visitor attraction for NASA's Marshall Space Flight Center, the Space & Rocket Center also hosts U.S. Space Camp. For more information, visit TheDreamRocket.com or the project's Kickstarter campaign.